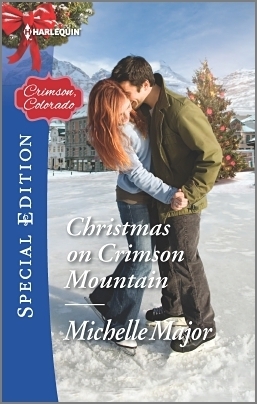 Michelle Major turns our emotions inside out with the latest in her Crimson, Colorado series! With her normal “get to the heart of it” style, she instantly wraps our hearts around two little girls and two people who have been hit hard by life. I found myself hoping against hope that these four people could heal each other’s pain. It’s sad, it’s sweet, it’s raw … and you even find yourself chuckling out loud a few times amidst the emotion because the kids are that adorable and sassy. Loved it! Connor Pierce was just seeking some peace and quiet when he rented a cabin on Crimson Mountain for a couple of weeks, but when the caretaker shows up with kids in tow, he is sure this is going to be a nightmare! April Sanders doesn’t know what to make of the unhappy man staring her down when she introduces herself, but there’s no way she’s going to turn those little girls away from the happy Christmas they desperately need. Connor doesn’t know how to interact with the world anymore, but he can’t resist helping these little girls heal when he sees the sadness in their eyes. Will this be just what he needs to wake up to life again? And will April finally have to face her fears and decide a future isn’t so bad?